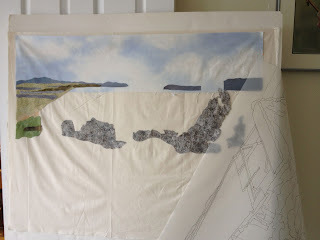 I have made it to the construction stage of my Irish Cottage quilt. I wrote about the piece first on February 20. Before my last trip, I had a small sketch made from the photo. Now I have a full scale diagram on mylar and began by first adding a sky - I found the perfect fabric out in Spokane for that. 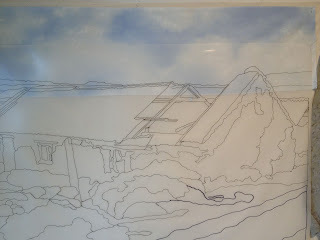 In the past day, I have begun to add in some of the landscaping and a bit of the cottage. Hard to imagine the cottage just yet, but I suspect it will grow quickly in the next few days. I can't resist once I start. My next task is the roof! It's looking good, Judy! Love that fabric you're using for the stones!